Crossman offers a wide variety of cylinder options. We manufacture standard cylinders from 4″ to 48″ in diameter with lengths up to 48″ long. Depending on the size, our cylinders have 1 or 2 polished seams running the length of the part. 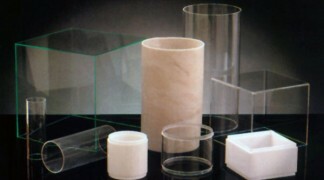 Larger cylinders are available, but require additional seams. We manufacture our cylinders by forming flat acrylic sheet in our specially made cylinder molds. The seam is then bonded with high quality bonding agents, and polished for minimal exposure. We also fabricate stepped bollards lenses in clear or white acrylic. Depending on the size, our cylinders have 1 or 2 polished seams running the length of the part. Cast or Extruded seamless cylinders are also available upon request.